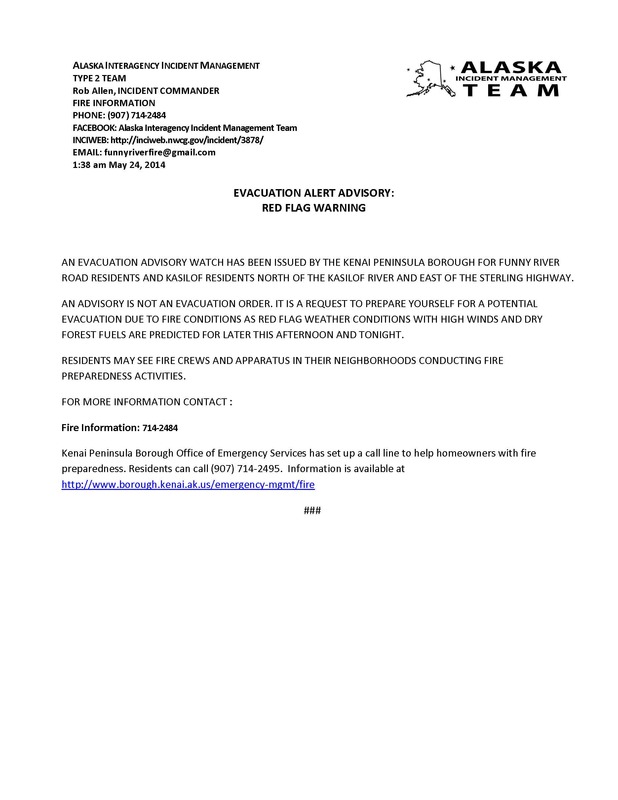 AN EVACUATION ADVISORY WATCH HAS BEEN ISSUED BY THE KENAI PENINSULA BOROUGH FOR FUNNY RIVER ROAD RESIDENTS AND KASILOF RESIDENTS NORTH OF THE KASILOF RIVER AND EAST OF THE STERLING HIGHWAY. AN ADVISORY IS NOT AN EVACUATION ORDER. IT IS A REQUEST TO PREPARE YOURSELF FOR A POTENTIAL EVACUATION DUE TO FIRE CONDITIONS AS RED FLAG WEATHER CONDITIONS WITH HIGH WINDS AND DRY FOREST FUELS ARE PREDICTED FOR LATER THIS AFTERNOON AND TONIGHT. RESIDENTS MAY SEE FIRE CREWS AND APPARATUS IN THEIR NEIGHBORHOODS CONDUCTING FIRE PREPAREDNESS ACTIVITIES. This entry was posted on May 24, 2014 at 2:07 pm. You can follow any responses to this entry through the RSS 2.0 feed. You can skip to the end and leave a response. Pinging is currently not allowed. 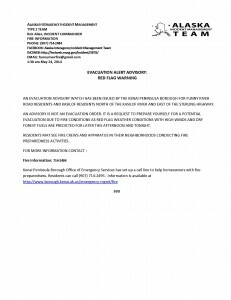 1 Response to "EVACUATION ALERT ADVISORY: RED FLAG WARNING"
This is an evacuation readiness advisory from the Kenai Peninsula Borough and State of Alaska Division of Forestry. This advisory is effective for the community of FUNNY RIVER ROAD from Mile 7 to include Salmon Run Drive and other roads feeding into the Funny River Road area. This advisory is due to erratic fire behavior conditions that may trigger an evacuation notice or order within the next 12 to 24 hours. There is No evacuation order at this time, only an advisory to be prepared. If conditions change this system will announce an order to evacuate and provide instructions of where to go or to cancel the warning. Please be prepared to leave immediately in the event an evacuation is initiated. For questions about the wildfires and related issues please call the information line at 714-2495.